Nabe is a very simple dish that is translated, simply as, pot. A better translation of nabe is Japanese hot pot. If you ever had Chinese or Korean style hot pot, you will understand the basics of this dish. If you ever had shabu shabu, you will know this dish. Nabe is a broad definition for meat and vegetables boiled in a pot. It is one of the simplest dishes you could make, yet there are hundreds of different flavours to enjoy. The simplest and most basic version is just a plain water nabe. Making this can be very simple, but at the same time, like many types of Japanese food, it can also be very complex. The dish starts off by placing the vegetables in the proper section. Usually, harder vegetables go on the bottom. Then, they add the thinner vegetables, noodles, mushrooms, tofu, and meat. If you go to a restaurant, they tend to put everything together and bring the pot out on a burner. Once it is boiling, you can dig in and eat. Usually, there are various sauces to dip the food into. Usually, you will get a ponzu. This is a tart dipping sauce that goes well with vegetables. They also provide a sesame dipping sauce which tends to go well with meat. 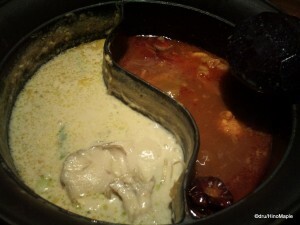 Unlike Chinese hot pot, where they mix a lot of sauces, including hot sauce, Japanese nabe avoids using too much sauce. While the basic nabe is just meat and vegetables in water, you can have a variety of soups available to you as well. The most typical is the Chanko Nabe. This is a hearty soup that was originally created for sumo wrestlers. Since it was made for sumo wrestlers, you must be a little careful as it was designed for people to gain weight. Today, you can also make your own with pre-made soup packs. Other popular flavours include miso, kimchi, and sesame. Generally, when you eat these styles of nabe, you don’t use any dipping sauces. It will generally taste good on its own. After you have finished the meat and vegetables, it’s common to add udon, soba, or ramen into the pot to make use of the soup. This is delicious as the meat and vegetable juice creates a wonderful broth for noodles. The only down side is that people generally get stuffed from the meat and vegetables alone and usually there isn’t any room left for noodles at the end. The only exception is the clear cellophane noodles. They use a variety of styles that vary in thickness and length. These noodles are generally eaten along with the meat and vegetables. In the end, you can’t really go wrong with whatever soup you order. If you make it at home, don’t worry too much about what type of meat and vegetables to add to the soup. It doesn’t matter too much, but if you want to enjoy the soup along with the food, it’s best to pair the food with the soup based on the packaging. Beef tends to go well with kimchi soup, and pork is better with a Chanko Nabe. Don’t be afraid to mix things up if you want to. Nabe itself is used to describe boiling food in a pot. Shabu shabu and sukiyaki are variations of nabe, but not always considered nabe itself. It can be similar to thinking about omelettes and eggs. When we say eggs, do we think of omelettes as the first food to be made with eggs? Probably not, but they are part of the same dish. Shabu shabu is closer to Chinese hot pot than nabe. 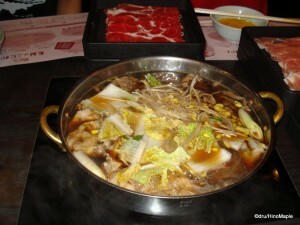 The name shabu shabu is now synonymous with the sound of moving thinly cut meat or vegetables around in boiling water. 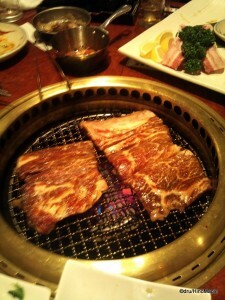 Traditionally, you grab a piece of meat or vegetable and place it into the put with your chopsticks. Then, you wave it around so that it boils evenly. Once the meat is brown, still slightly red, you can take it out and put it into the dipping sauces. The dipping sauces are the same as a plain nabe with just water. The major difference between this and plain nabe is that the meat will come out softer and almost fluffy due to the cooking method. It will also taste lighter, yet hearty. If you prefer sweet food, sukiyaki is a better dish. 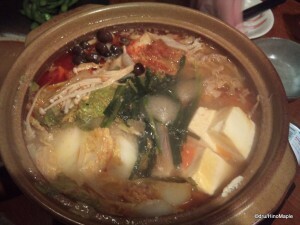 This is similar to nabe in the fact that you just boil meat and vegetables in a soup. The difference here is that the soup is much sweeter and darker. They tend to use a shallow heavy pot rather than a deep pot to allow an even cooking temperature. This dish tends to be heartier, in my opinion, even though it is sweeter. The shocking part for most westerners is the dipping sauce. One raw egg is used to dip the meat or vegetables just before eating. In Japanese cuisine, it’s common to use raw egg for various dishes and for dipping. The use of the egg helps to mute the sweetness and add a unique texture to the food itself. If you don’t like raw eggs, you don’t have to use it. It’s still delicious to eat sukiyaki without a raw egg, but for myself, I prefer it with a raw egg. When looking for a restaurant in Tokyo, there are many places you can visit for nabe. One recommendation for tourists would be to visit Amataro. This is a large chain restaurant that serves both shabu shabu and yaki niku. Yaki niku is Japan’s take on Korean BBQ. This shop tends to be very busy and slow to bring orders, but due to their large size, they tend to have good English menus. The quality is okay, but when you eat so much, you won’t worry too much about the quality. The second is Nabezo. This is a middle class nabe restaurant. They serve all types and they will be somewhat friendly to foreigners. They do have English menus, but there won’t be many pictures on the English side. It will always be best to go with someone who can at least read or speak some Japanese as this will help you find the best foods to eat. Generally, both restaurants offer all you can eat, and all you can drink sets. You can eat and drink as much as you want for up to an hour and a half. It may not be the cheapest meal you will get, but if you can eat and drink, it’s well worth it. Heading there in the summertime will be easier than winter as nabe tends to be a winter dish. Do your best and hopefully you can enjoy great nabe. This entry was posted in Food and tagged barbecue, chanko nabe, Chinese hot pot, hot pot, Japanese barbecue, Japanese BBQ, Japanese hot pot, kimchi, korean barbecue, Korean bbq, miso, Nabe, ramen, sesame, shabu shabu, soba, sukiyaki, udon, yaki niku, yakiniku by Dru. Bookmark the permalink.